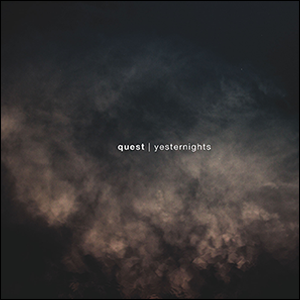 "The history of Quest goes back to the mid-90's when Aambient House' was looming large and I got tired of playing the same noise show as Kapotte Muziek and Beequeen which focused on a more dark drone sound. It was time for something lighter, ambient and, why not, perhaps a bit more rhythmical. A drum machine was bought but never understood and was only used for a couple of pieces on the 'Questionmark' LP, released as QST in 1994. That was the premature end of QST, but as Quest the project became more ambient and less rhythmic and a bunch of releases were released on Noise Museum and Lunar in the mid to late 90's. Sometime in the late 1990s new possibilities and techniques came about and it was decided to move away from analogue synthesizers, field recordings and four track machines. It had been a good run. Fast forward to 2014 and another development in technology. Apps developed for the iPad make it possible to create the rhythm music dreamed off in the mid 90s but that was never realized back then; QST all of a sudden gets a restart, with lots of pieces being composed and a 12" released by Inta (early 2017). An old fan of the Quest music felt he was left behind, and asked 'so is this technology also useful for some good old ambient music as Quest? Since then an album has been released by Where Ambient Lives and one is upcoming on Infraction Records. 'Yesternights' was composed over a period of two years working off and on before finishing it."